I arrived abroad a week early in Rome for a class called “Cultural Introduction to Italy,” arranged through SAI and my school, Florence University of the Arts. It was a course that promised three credits in only one week, with a schedule listed on the syllabus from 8 am to 8 pm—a little daunting at first…I mean what could we possibly be doing ALL day long? 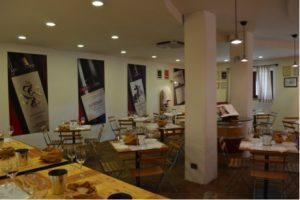 I soon found out that we would visit a number of historic landmarks, monuments, museums, Basilicas, restaurants, small cities and drive through the rolling hills of the Umbrian and Tuscan countryside. 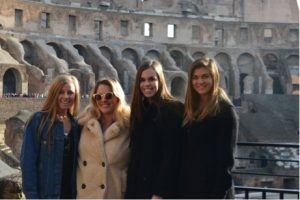 Colosseum tour with my friends from home and roommate for the week! I was apprehensive at first about taking this class, mainly because we would arrive in Florence only one day before the first day of classes, and miss SAI and my school’s orientation completely. But let me tell you, this week was by far my favorite and the absolute best way to start off my study abroad experience! I met students from many universities back in the states and got to learn from amazing professors who are so passionate about their home country. We started off the week with two days in Rome, where we were given a guided tour of the Colosseum, Roman Forum and the Altar of the Fatherland. In the same day, we also stopped by the Pantheon, Trevi Fountain, Spanish Steps, an authentic family-run restaurant and one of the best gelato shops in the city. A fully packed day, but I wouldn’t want it any other way! Seeing all of these monuments in person was amazing after learning about them in textbooks for so long. The next day we explored the Vatican City area, with a tour through Saint Peter’s Basilica and the surrounding area, had free time for a few hours, and then transferred to a smaller city called Caprarola in the late afternoon. 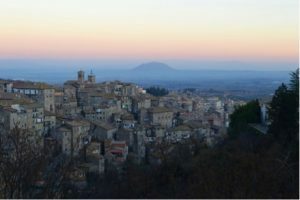 Throughout the rest of the week, we spent our time in various cities throughout the countryside such as Viterbo, Bagnaia, Bomarzo, Orvieto, Torgiano, Perugia and Assisi. In each destination we visited something that the town or region was known for! Some highlights include the Monster Park in Bomarzo, Saint Patrick’s Well and the Duomo in Orvieto, a local chocolate and pastry shop in Perugia and the Basilica of Saint Francis in Assisi. We had lecture at various points throughout the day, but were always given free time in the late afternoon or evening to explore the new city that we were staying in! At the end of the week, we parted ways in Florence, wishing we could do it all over again. The best part about this week was that it was educational AND affordable! We were set up in hotel accommodations throughout the whole week and had at least one meal (and sometimes even two meals) provided to us each day that was included in the course fee…what a steal! The course load was manageable as well, as most of the credit was participation on a day-by-day basis and the completion of a homework assignment every night. As I started to plan more and more trips throughout the semester, I realized how invaluable this course and this experience was to me. It was one I will never forget and I encourage anyone even considering this course to sign up as soon as possible—you won’t regret it! Kristin is an SAI Florence spring 2018 student from Colorado State University.